Lotions and butters are some of the most popular bath and body products, but they’re also products that can raise the most questions. Questions such as “Do I need a preservative for my product?” “Which preservative do I use?” and “Are preservatives safe?” are some of the most common ones we see, and we hope this thorough guest post by formulation guru and fellow crafter Susan Barclay-Nichols will help clear up some confusion. Susan is an expert in cosmetic chemistry, and in this post she gets down to the nitty-gritty of which preservatives work best in which products, their usage rates and their ingredients. It’s a one-stop-shop for everything preservative related! Read on to learn about the wide world of preservatives and how you can safely use them in your products. Keep in mind, the type of preservative you choose is up to you, and I’m glad that there are effective options for everyone out there who wants to responsibly use a full spectrum preservative. All Bramble Berry preservatives have been approved for use in body products. Now onto the guide! – A.M.
You’ll notice there are actually two areas of contamination in the product. The first is the great big green spot on the left side, but did you notice the brown-y orange streak to the right hand side of that on the side of the jug? Yep, there’s a little more contamination for you! I made this lotion without preservatives to show you how quickly things can go off. I made this sixteen days ago. (It might have gone off earlier. This was the first chance I had to check it, to be honest!) I did all the things I generally do – I heated and held both phases, I made sure all my equipment and workshop was clean – but I left out the preservatives. I covered it tightly with Press & Seal in this jug after it had cooled to room temperature. It’s been cold in the workshop – below 10˚C – which is quite chilly considering a fridge should be kept at 0˚C to 4˚C, and room temperature is 18˚C to 22˚C. It is also quite damp back there as we’ve had a bunch of rain since Halloween – just about every day – which is normal for this time of year. I have to point out that I get weary of hearing people saying they’re going to leave the preservative out of their products because “it’s just for me”. Do you want to smear THAT on your skin? Do you want to give that to someone you love? Please don’t. Products are contaminated a lot sooner than you think, and contamination is almost always there long before you see the green or orange bloom! What could we have done to prevent such a tragic lotion contamination? Preservatives! Effective, broad spectrum preservatives suitable for a product that contains water, like a lotion. What’s a broad spectrum preservative? The ideal preservative will be a broad spectrum preservative, meaning it kills off bacteria, mold, yeast, and other fungi. The preservatives we buy are called synergistic preservatives, which are combinations of preservatives intended to eliminate all the various contaminants we could see in our products. Preservatives kill the microorganisms in our products in a few different ways, but the primary way is to cause some kind of chemical disruption that leads to death. They leak their internal fluids, they can’t maintain pH, their cell walls break open, and so on. Which preservatives could we choose for our products? There are quite a few good and effective preservatives found at Bramble Berry, but you want to make sure you choose a broad spectrum one – or a combination of preservatives that will cover all the bases – suitable for your product. For instance, if you want to make a sugar scrub that doesn’t contain water, you’ll want to pick something that is oil soluble, like Phenonip. 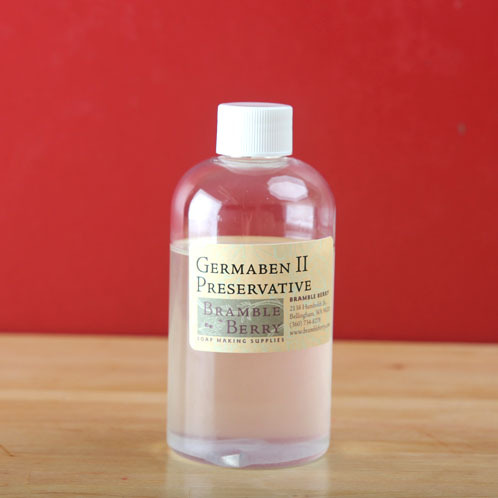 If you’re creating a product that contains a lot of botanicals, you’ll want to consider Germaben II as it’s great for hard to preserve ingredients. If you want to make a lotion, you’ll want to choose something that works with water containing products or emulsions. Let’s take a closer look at the preservatives you can find at Brambleberry! INCI: Propylene Glycol, Diazolidinyl Urea, Methylparaben, and Propylparaben. Germaben II is a liquid broad spectrum preservative that should be used at 0.5% to 1% in the cool down phase of your watery creations. The INCI is Propylene Glycol (56%), Diazolidinyl Urea (30%), Methylparaben (11%), and Propylparaben (3%), which means it is a formaldehyde releaser that contains parabens. Because it contains three different preserving chemicals, it is suggested for use as a preservative for products that are hard to preserve, such as those containing a lot of botanical or proteins, like a toner or lotion with a lot of extracts and hydrosols. (I like it for things like strawberry extract that are very hard to preserve!) Although the manufacturer notes it can be added to your products at emulsification temperatures – up to 80˚C – it’s best used in your cool down phase at less than 60˚C. Optiphen is a liquid preservative appropriate for fighting bacteria and yeast in our products (I can’t find any information on its efficacy against mould). Its INCI is Phenoxyethanol (and) Caprylyl Glycol. We know phenoxyethanol is a very effective against bacteria and yeast, but what about caprylyl glycol? It is paraben free and is not a formaldehyde donor. Caprylyl glycol (aka 1,2-octanediol) is a good bacteriostatic ingredient (meaning it limits the growth of the bacteria but doesn’t kill it) and bactericide, but it isn’t very effective against yeast or fungi. Which means we really don’t have a fungal killer in this preservative. Its suggested use is at 0.75% to 1.5% in the cool down phase of our product (best below 37.5˚C or 100˚F). It’s suitable for anhydrous products or things like sugar scrubs that do not contain water. It’s best in products with a pH of 6.0. Some people report Optiphen can de-stabilize their emulsions, so it’s suggested to add this preservative at 45˚C to 55˚C (113˚F to 131˚F) and continue mixing until cool. It can thin out a cationic emulsion, but it will thicken as it cools, so don’t worry too much! Usage: 0.75% to 1.5% in the cool down phase of your water based creations. *Editor’s note: There is some debate over whether Optiphen can be used for water-based creations. You can read more about this on Susan’s blog. For water based creations, Optiphen ND is recommended. No pH restrictions for this preservative. Optiphen ND is a liquid broad spectrum preservative with the INCI Phenoxyethanol (79% to 81%), Benzoic Acid (11.5% to 12.5%) Dehydroacetic Acid (7.7% to 8.5%). It is suitable for products containing water and can be added at any point in the product making process as it isn’t heat sensitive. It is best used with products with a pH under 6.0. It’s paraben free and isn’t a formaldehyde donor. We know benzoic acid has moderate bactericidal activity and great fungicidal activity, and we know that phenoxyethanol has great bacteria and yeast killing abilities, but we don’t know anything about dehydroacetic acid. What does it do? Dehydroacetic acid is one of our organic acids. It has great fungicial properties but low bactericidal properties, so it’s a good addition to this mix to make it a broad spectrum preservative. Unfortunately, it tends to work very poorly when included at a pH of 5.0, and it can be inactivated easily by cationics, non-ionics, and proteins. INCI: Phenoxyethanol (and) Benzoic Acid (and) Dehydroacetic Acid. Usage at 0.2% to 1.2% in any phase of your creation. Suitable for creations containing water. Not suitable for anhydrous products. May not be suitable for products that include cationic polymers or quaternary compounds. Best used in products with a pH lower than 6.0. 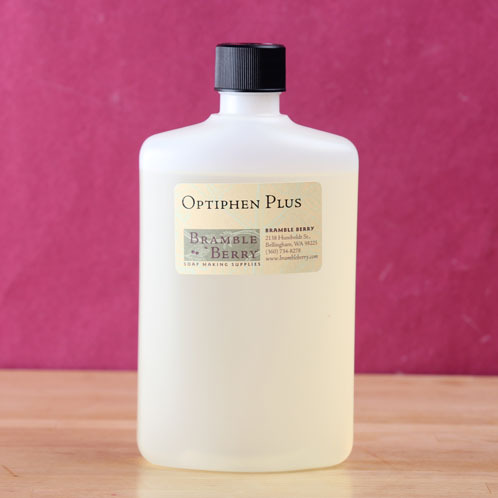 Optiphen Plus is a liquid broad spectrum preservative with an INCI of Phenoxyethanol (and) Caprylyl Glycol (and) Sorbic Acid. (It differs slightly from Optiphen with the inclusion of the sorbic acid.) As it isn’t heat sensitive, we can include it in our water-based creations at 80˚C or lower in the water phase of our process. It is not a formaldehyde donor. The one down side of using Optiphen Plus is the limited pH range of the product. It works best at pH 6.0 or lower, which means you will need to test your products to ensure they are in the right range. For instance, if you’re using decyl glucoside with a pH that can range from 7.5 to 11 as your primary surfactant, you’ll need to get that pH down substantially to play well with Optiphen Plus. Usage at 0.75% to 1.5% in the heated water phase of your product. Suitable for products that contain water. Phenonip is a liquid, broad spectrum preservative. It can be used at 0.25% to 1.0% in all your creations, including anhydrous ones (those that do not contain water) because some of these parabens are oil soluble! With all these parabens, it is considered a very powerful preservative, so it’s suitable for those creations that might contain a ton of botanical or natural ingredients, like extracts or hydrosols. It’s paraben based and it is not a formaldehyde donor. It’s suggested that we use Phenonip in the heated phase of our creations as it dissolves around 60˚C to 70˚C. If you are making a lotion, it’s suggested to divide the product up between the water and oil phases. 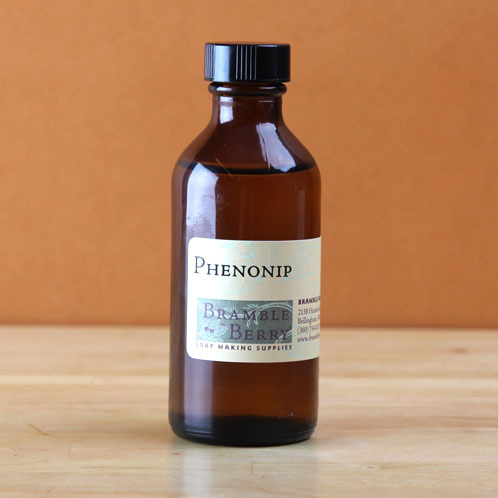 If you want to use it in a cold product, heat up some propylene glycol or glycerin and add the Phenonip to that before adding it to your product. If you want to use it in a surfactant mix – say, a shampoo bar or body wash – then add it to the heated surfactant phase. Because Phenonip is oil soluble, it’s great for emulsified scrubs, oil based scrubs, lotion bars, scrub bars, hair care bars, and any other products that don’t contain water but might be exposed to it. Usage: In the heated phase of your product. Divide into the oil and water phases in lotions. Suitable for all products, including anhydrous products. Suitable for pH ranges of 3.0 to 8.0, so pretty much all of our products. Let’s take a look at one of my favourite winter body butter recipes, and think about which preservatives might work well with it. I’ve chosen to add cocoa butter at 5% to this product as it’s an approved barrier ingredient, which means it can help our skin prevent wind or cold chapping by creating an occlusive layer. I’ve chosen the calendula extract as it will help soothe irritated and sensitive skin. You could use another oil soluble extract in its place, such as chamomile or evening primrose extract, both of which work as great anti-inflammatories. And I’ve chosen rice bran oil as it has a lovely mix of linoleic and oleic acids, great for barrier repair and softening and moisturizing respectively, as well as a good amount of anti-inflammatory phytosterols. 1. Weigh your water phase into a heat proof container and put into a double boiler. 1a. Weigh your total water phase on a scale – jug and all – so we can compensate for the lost water before mixing. And set some water in a separate container to heat. A pot with water on the stove or boiling up the kettle works well. You don’t need to boil it the whole time – bring it to boiling now and you’ll have some less-than-boiling water for step 3a. 2. 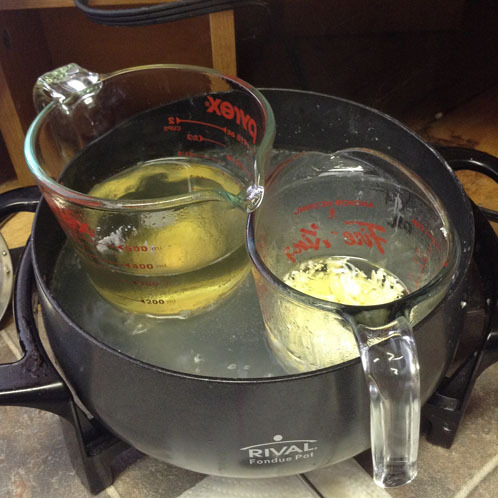 Weigh your oil phase into a heat proof container and put into a double boiler. 3a. Remember how we measured the water phase in step 1a? Measure it again – zero your scale and measure the jug and all. Add enough of the warm water to get you to the total weight from step 1a. 4. When both phases reach 158˚F, pour one phase into the other and mix very well with a stick blender, hand mixer, or stand mixer. Mix periodically as the temperature drops. 5. When you reach 113˚F, add your cool down ingredients and mix very well. 6. Allow the lotion to come to room temperature before bottling so you don’t get condensation on the inside of the bottle or lid. I suggest using jars for this recipe as it’ll be quite thick. 7. Always label your bottle with the ingredients and date so you can replicate it or throw it away when the shelf life expires. What preservatives would work with this recipe? To determine this, we need to determine what this product is. It’s a lotion, which means it is an emulsion of oil and water. So we need to choose a preservative that works with water containing products and not something that works only with anhydrous (non-water containing) products. Our pH is slightly lower than 6 – around 5.8. We might be using a cationic or positively charged emulsifier like BTMS-50 or a non-ionic or neutrally charged emulsifier, so that’s important to remember. And we’re using harder-to-preserve botanical ingredients, like aloe vera, so we’ll want to use a preservative meant for that purpose or use one at maximum suggested usage levels. When choosing which preservative to buy, you could work with just one that works for all products, like Phenonip, or get one for anhydrous (containing no water) products and one for water containing products. Use them at the maximum usage rate to start, then try them at slightly lower levels, if you wish, but no lower than the suggested minimum usage rate. 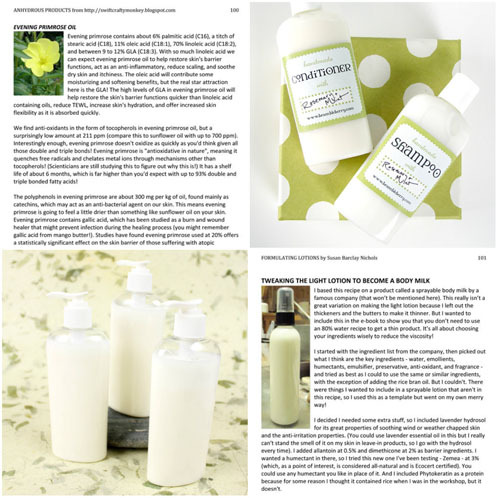 Lotion Making 101 (a 305 page e-book that includes many recipes for creating hand and body lotions, creams, body butters, and formulas to help you get started on formulating your own). Which toiletries or cosmetics can I make only using phenoxyethanol (C8 H10 O2) as a preservative and what would their shelf life be in and out of the fridge? Research is a bit conflicting, some articles say it is a comprehensive preservative but other sites combine it with another preservative ( like yours). What are the temperature and PH restrictions for this preservative? I live in a country where everything has to be ordered from the UK, but I did manage to buy this preservative but now am at a loss of what to do with it. So far I’ve only made water/organic free recipes and liquid soap or Aloe Vera recipes which I keep in the freezer. Thank you for your invaluable information… everytime I google something… up pops your site. I’m not entirely sure! I do know phenoxyethanol is great for protecting against bacteria and yeast. However, our preservatives combine phenoxyethanol with other ingredients like Sorbic Acid, which helps prevent against yeast and other nasties. My worry is that phenoxyethanol on its own may not protect against everything that can grow in lotion. I would recommend contacting the manufacturer of the preservative to find out more, including what the temperature and pH restrictions are. It may also be helpful to make a small test batch with it and keep it at room temperature. That way you can see if it protects against mold, yeast, fungi, etc in your products! Your prompt reply is much appreciated. I realise I’m complicating the issue and should just order a comprehensive Preservative. I have to ask if you have in suppliers in Italy, otherwise will look at ordering from the Netherlands. For further on down the road… what ratio of sorbic acid to Phenoxyethanol do you advise? I think comprehensive preservatives are the way to go! 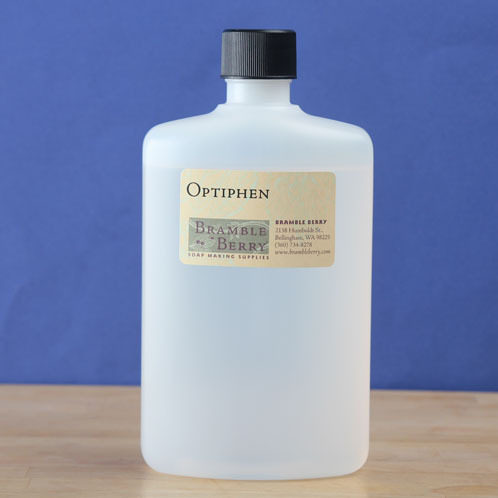 Optiphen Plus works great in water-based products, like toner and cleaning spray. Phenonip is a great all-purpose preservative that can be used in lotion, salt scrub and dusting powders. It can be used at .5-1% in your products. The reason that Phenonip is heated slightly is to help it mix in well! It just needs to be slightly heated so the mixture is nice and fluid, allowing that preservative to mix in. Don’t make the mixture hotter than 200F, otherwise the Phenonip may start to degrade. Thank you so much for your suggestion about Suttocide A! We haven’t worked with that product before, so it’s something we’ll consider for future posts. This has been somewhat helpful but I’m kind of overwhelmed with this depth of info haha. The first batch of body butter I’ve made lasted for a long time with no noticeable mold growth. The ones afterwards contained honey and aloe vera gel which I’ve read contains water. With that being said I’m going back to the basics of using butter, oil, and essential oils. Would I still need to use a preservative and if so which would you recommend? I understand, preservatives can be a bit confusing! As a general rule of thumb, preservatives need to be added when the product contains water (lotion), or will get water splashed into it during use (a scrub kept in the shower). We consider aloe vera liquid and gel similar to water, so we recommend a preservative in that case. If your aloe vera liquid already has a preservative, like ours does, you’ll still want to add one just in case. You can add it on the lower side though, around .5%. If you’re selling a product and there is any chance it may get water in it, I would recommend a preservative to be on the safe side. Even with instructions to store the product in a dry place, it may still get water in it, which can lead to mold and bacteria growth. Thanks so much for all the wonderful information and the knowledge you take the time to share with us. I frequently haunt the Soap Queen blog, but this is my first time commenting. My main focus for a long time has been purely on perfumes (oils, solids, and in perfumer’s alcohol) so preservatives have never really been something on my radar, so to speak. That said, I have a question a product that I make. It’s an oil based serum for the face that contains nothing but a proprietary blend of exotic oils and essential oils that I’ve made and used for myself for years, but recently started offering it to my customers – who’ve gone gaga over it. I realize that since it’s an oil based product it TECHNICALLY doesn’t need a preservative, but it has occurred to me that since there always is the possibility that water could be introduced into the dropper bottle I package it in that perhaps I should be incorporating a preservative. Even though I always make sure that customers understand that it’s important to not introduce water into the bottle, it’s still a possibility. The last thing I want is to have nasties start growing in a customer’s bottle of serum. What would you suggest as the best preservative option for a product like this, keeping an eye toward the “no formaldehyde, no parabens” crowd? I would recommend using Optiphen. It’s a paraben and formaldehyde free preservative that works great in oil-based products. We recommend using that at .5-1.5% in your products. Because it’s going on the face, I would recommend using .5%. Going higher than that can cause dryness. Using it at .5% will protect from mold and bacteria and prevent any dryness. May I ask for a face cream, and for a body cream, and lotion, what amount is best for those varying creams and what the shelf life would be? Thanks! I’m very confused about the right preservative to add to my products. None of my products contain water. At this time I am not adding any preservatives and looking to add a safe preservative for my anhydrous products. Can you suggest a solution? Absolutely, I can definitely help! What are you wanting to add preservatives to? Hi guys, thank so much for this simple break down. To date, is there any paraben free preservative that can be used with BTMS ? Optiphen plus is definitely a curdler. I’ll try those two and see if they curdle as well. Thank you! Just to be sure, they are broad enough in spectrum that I wont have to add another preservative e.g. for mold. I thought I read that ND is easily inactivated by cationics? Wouldn’t the BTMS 25 or 50 then inactivate it? Optiphen is a great option for you. It’s paraben and formaldehyde free and works in a wide variety of recipes, like lotion and scrubs. I make sugar scrubs and there is so much debate about preservatives. My scrubs are not emulsified. I don’t like them. For the most part, Blogs, such as this one or swiftcrafty say to use a preservative suitable for oil based product. However. Over the last year, I have had much conversation with two chemist. One a microbiologist, 30 years with a well known world wide corporation and maker of all things house hold, from cleaners to food to cosmetics and soaps. The other a well known cosmetic chemist. They both say , that a scrub that is oil only can not be preserved. Basically the preservative gets locked into the oil. If and when water is introduced into the product via wet hands or the shower, the preservative is unable to get to the water to do it’s job. The only way to preserve a scrub is if it is emulsified, has a water phase and a preservative that works in both oil and water is used. I hear many people say that their preservative works, but I have not found anyone that has actually had them challenge tested to back up that claim. I would love to know I could use a preservative in my non-emulsified scrubs and know that it works and that I am not wasting my money. But I don’t. So I keep educating my customers of safe use and keeping the product dry. Hi. I am making a melt and pour soap with real aloe Vera gel in it (straight from the plant.) Would I need a preservative of any kind? 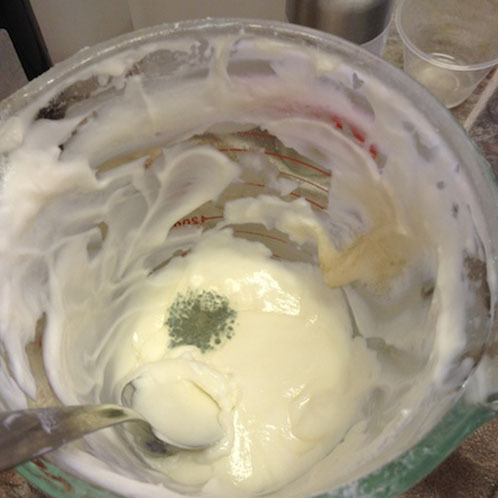 In our tests and recipes, adding a watery liquid like aloe vera gel can be difficult. It may not mix in to the soap very well, and can cause the soap to be watery. Hi, thank you for all this information, i can tell you put a lot of time on it. I want to make a body scrub but i dont know what preservative to use, its an oil base preservative, and i dont want to use anything with barabens on it, any suggestion ? Thank you in advance for your time. Would Optiphen Plus also work in emulsified scrubs (no water added, just e-wax) and could I also use Optiphen Pkus in a water based body spray (water, aloe, polysorbate 20, glycerine, fragrance/essential oils)? Optiphen Plus works great in water-based products, so I think it would work great in the body spray recipe! It can be used at .75-1.5%. I saw this product for sale http://www.luckyvitamin.com/p-30478-canus-goats-milk-lip-balm-015-oz. According to their ingredient list, it’s a lip balm that contains fresh goat’s milk but no preservative. How can they market this safely? I’ve been researching ways to incorporate goat’s milk into my body products, and I understood that anything with fresh goat’s milk would require a preservative (other than soap). While I can’t speak for their products, I can tell you that lip balm with added goat milk does have a shorter shelf life. Because an actual milk is added to products, there is nothing that can be added to keep it from spoiling. Milk naturally will stay fresh for a few weeks, then starts to go rancid. This will eventually happen in lip balms as well. You can keep the lip balm in the refrigerator to make it last longer, but there is nothing that can actually stop it from spoiling. 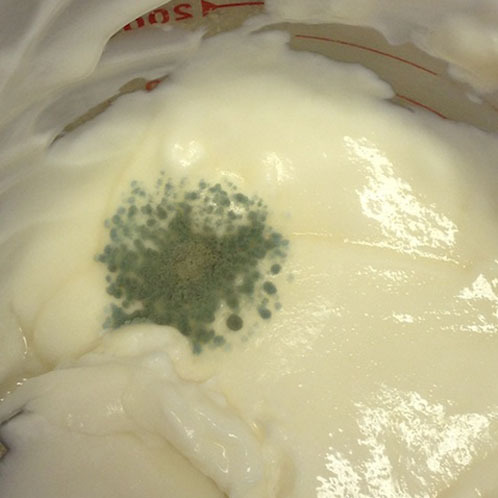 Preservatives stop mold and bacteria, but do not extend the milk shelf life. I just made your lovely Argan& Shea Lotion. It emulsified beautifully, initially. Then I added the green tea extract, lemongrass & rosemary EOs, Optiphen Plus and a few drops of color (that I typically use for lotion with success). Whisk, whisk, whisk at this point (too thick for the stick blender), and a few minutes later it began to separate slightly…more like a light curdle…boo hoo. A similar thing happened once before with a face cream (also used BTMS-50), so I was starting to think it was the emulsifier. But (though I can’t recall for sure), I likely used Optiphen Plus for that recipe too….so now I’m thinking it’s maybe the preservative?? I put the cream in tubs, and it’s totally useable (for me and family) and feels wonderful once rubbed in. But I want to avoid this curdling phenomenon, especially when using nice ingredients like argan oil, shea butter and extracts. I’m almost out of the Optiphen Plus, think I’ll just stick with the Germaben II and Germal Plus for future makes (especially with BTMS-50)…in case that’s the offender. Do you have any thoughts on what could cause this minor separation/curdling (almost makes the product almost “airy” and light). Ironically, the aforementioned face cream actually turned out to be my very favorite to date, but I probably wouldn’t give it to anyone since the texture isn’t exactly creamy like everyone expects. Thanks for your thoughts!! Love your site….so helpful in so many aspects of “product” making. Started CP soaping recently, and I’m already ADDICTED :-)!! I am totally new at this and already have garnered the importance of a preservative. So if I am making a salt or sugar scrub and adding Phenonip, when would I add this, since there isn’t a heated phase? Also I wanted to make a coffee sugar scrub but was concerned that I am just asking for it to go off with the coffee. Will the Phenonip keep it also and for how long? Thank you of any advise. So I believe I read above that liquid soap doesn’t need a preservative? I do have hopes of doing liquid goat milk soap, along with lip balm, body butter and hard bar soap. In time, these would be for sale. So how does one make liquid soap? I have read that one adds water to our soap bar? So wouldn’t this, then, need a preservative? As mentioned in several posts above, I am worried about the health of our body when using preservatives. How do we know which ones are safe (been tested as such) for our body and why? What about adding colors to any of our products? Which ones are safe to use? I work in a bakery and cringe every time I make a cake with die in it. I often wonder what its doing to me, when I have my hands green, red etc. LOL. And what is it doing for our customers? I want to learn more about safe colors. That is correct! Liquid soap has a pH that doesn’t allow mold to grow, so it doesn’t need a preservative. If you add goat milk to your soap mixture, it will saponify (or turn into soap) and the shelf life will be longer. However, if you dilute your mixture with goat milk, that shelf life will be a couple of weeks, longer if it’s stored in the fridge. As for which preservatives are harmful, that’s a difficult question to answer! What is harmful to some may not be harmful for others. All the preservatives we sell at Bramble Berry are skin safe. You may also like Optiphen, which is paraben and formaldehyde free. I would recommend watching our Making Lotion From Scratch video. Anne-Marie talks at length about preservatives and everything else you include in your recipe and why. I think to add water you just have to sterilize it or boil it. The PH of all soap has to be high or if you add acid I believe it reverses saponifioncation process and makes a soap scum gunk. I’m wondering that gunk could grow some bacteria in it of it’s left out. We recommend using distilled water in your lotion. Tap water, even boiled, can have microbes or bits of metal in it. That can cause mold and bacteria to grow. Hello! I’ve just discovered your website and I am loving it! I especially love the spotlight on ingredients articles you do, I’ve learned so much! I am hoping you can help me with a question I have. I plan on making myself some eye cream and I’d like to avoid using a preservative since my recipe does not contain any water and I’ll just be making a small batch for myself. However I’m not sure about the aloe vera gel I am planning to add. Even though it’s not water it it kind of water-y….should I be using a preservative if my recipe contains aloe vera gel? The aloe vera gel I bought is actually only “99.99” percent pure as they have added .001% of a preservative to the gel already. So I’m not worried about the aloe gel itself going bad, but will mixing it with the other ingredients (shea butter, almond oil, rose hip oil) shorten the shelf life? 1. I just made a batch of body cream or lotion after the fact that I found out all about the perservatives. Can I add Optiphen to a finished batch? 2. I only make 8oz. lotion for me and don’t have a scale so when you say in the tutorial for lotion making, the perservative at 1% or .2oz that’s not 2 ounces so could you give it to me in measuring spoons. I believe you can add that preservative to your cooled lotion. If it isn’t incorporating well, you can heat it in the microwave slightly to help it mix in. Just make sure your mixture is cooler than 176F, otherwise that Optiphen may not work properly. I have just started making cold process soaps and to test them out we made some body wash (soap + water) does this need a preservative since it is soap? My next question is about a body butter that contains no water (just oils CO + Shea butter) would this need a preservative? That’s a great question! Cold process and liquid soap has a pH level that doesn’t allow mold to grow, so it typically doesn’t need a preservative. However, if you’re putting your bar soap into water, I’m not exactly sure! That’s not something we have tested. It may need a preservative because the water wasn’t mixed with the oils during the saponification process and allowed to turn to soap. Phenonip may be a good one to add. You can add that at .5-1% of your recipe. !! Everyone I know uses the two together . This is Good stuff to learn!! This is the best preservative article ive read all day lol! im just kinda confused by all the info out there. I bought Optiphen because I read it works in water base formulas so I figured I could add it to my bug spray and tanning oil recipes which are both at least 70% water and the rest is oil, extracts, and Plantamulse instead of poly 20. After reading this article im wondering if I should have bought Phenonip instead as it seems to be more broad spectrum than Optiphen. Im also working out a formula for a really bubbly bubble bath as well and it contains both oil and water, I also want to try my hand at sunscreen so im wondering what to use in both of those things as well, I though Optiphen would cover everything but I guess I didnt quite do enough research lol. 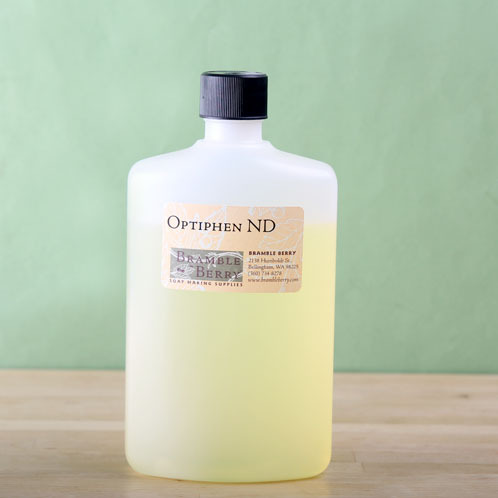 For water based creations, we recommend Optiphen ND. If you have any more questions, don’t hesitate to ask! Regarding preservatives in your body wash, preservatives aren’t generally necessary in liquid soaps, but can be added if desired. The pH level in soap defends against mold and bacterial growth, but adding a little doesn’t hurt! Yes, you can test the pH of your products using pH strips 🙂 They really come in handy when making so many things! Thank you so much! Yes, a huge help! Would polysorbate 20 be essential to a body spray in order to incorporate your fragrance oils or essential oils? It shows it’s out of stock right now and I can’t wait for it! I plan to use glycerin in my body spray. Thank you ever so much for your time; it’s much appreciated! You’re so welcome :). If you don’t use Polysorbate 20, your body spray will not incorporate, and the oils and water will separate. Of course you can do this but, but it’s not ideal. Thanks a bunch! Hope the P20 comes in soon! I’m pretty new here so I hope someone is still able to answer questions on an older post. I have several questions regarding Optiphen Plus and would so appreciate any help. I recently purchased OP from Bramble Berry along with a ton of other lotion supplies and fragrances, and I’m wondering if I can use OP in body wash and body sprays along with my lotion? I read that the ph needs to be lower than 6 in order for the preservative to work. Would I need to test the ph level of all my lotions, body wash and sprays? And, if I do need to test them, would any old ph test strips work? Also, do you have any advice/recipes/tips on making body spray? Thank you so much for any help. As I comment in my post, as a general rule it’s always a good idea to mix up your preservatives, as they all have their strengths and weaknesses in what they kill, so a combo can give you a broad spectrum, and keep the overall levels of each down low, which helps with both stability and irritancy. 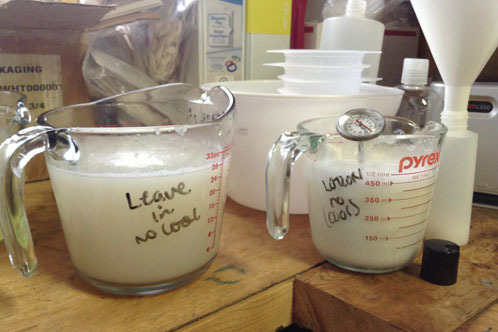 The finished pH of the product will have a major impact on the efficacy of the preservative. Bacteria thrive in the ph range of 5.5 to 8.5. Yeasts and filamentous fungi prefer the ph range 4-6. Use a good antifungal preservative at a low ph or a good antibacterial preservative at a high ph may provide a better broad spectrum preservation. Reduce the amount of unbound water in your formulation – this will inhibit microbial growth. Lowering the water activity and water partitioning of a preservative prevents the migration of it away from the aqueous phase. This can be accomplished by increasing glycerin and other polyols above 5%; reducing the surface tension between the oil phase and water phase with functional siloxanes, particularly dimethicone polyethers and flurosilicones; and minimising sources of energy for microbial growth (e.g., carbohydrates, anionic surfactants, proteins, and natural gums). Thanks so much for taking the time to leave a comment with such great info! Is there a lab that tests PH level and also shelf life of products we create? Ok, so how does a person know the PH of their finished product? How do we know which preservatives are actually harmful to the body? This is what has actually held me back from making lotion etc. I raise dairy goats and am eager to learn to make goat milk products. I’ve got a friend who makes many products for sale. She said she prefers Liquid Germall Plus for the lotion. Comments? Also say I’m going to make a body butter for sale. Keep in mind I’ve never made anything like this before. Say it contains Shea Butter, Extra Virgin Coconut oils. And I would use Essential Oils (far far more than just fragrances) from my trusted Essential Oil company). So no preservative is needed for something like this, if going to sell the product? I have read that after a little time, the butters (like Shea etc.) lose their potency. So how does a person know shelf life? Is there some place to test out this? As for liquid germall, we haven’t used that product, so I’m not entirely sure! We have great luck with the preservatives from brambleberry.com. The company’s material is a bit difficult to read at times because they’ll state something in one brochure, but leave it out in another. This is the case when it comes to whether we can use Optiphen in anhydrous products. I’m going to refer you to the post Optiphen revisited (http://swiftcraftymonkey.blogspot.ca/2011/11/optiphen-revisited.html) on my blog because it’s too long to recount here. As for using it in anhydrous products, there is some debate about whether or not Optiphen Plus and Optiphen ND are suitable for anhydrous products. In their own marketing materials, ISP sometimes notes they are and, at other times, says nothing. This is the topic of much debate, and I don’t feel comfortable suggesting that someone use Optiphen ND or Optiphen Plus in anhydrous products. Phenoxyethanol is sparingly oil soluble, which means it can be dissolved in oil, but not enough that it could effectively protect your product. I really enjoyed the article–I’m making some sugar scrubs to give as gifts and I’m trying to figure out a preservative to use. I would be interested in what Susan’s response is to Marmar’s comment above and link regarding the discrepancy between Ashland’s information about Optiphen and the information she shared. Thanks! Thanks for posting that Anne-Marie. I definitely missed it the first time around. Thanks for the response Susan. Great article. I love Susan’s Blog and Susan herself. She is a treasure and her experiments and supremely generous sharing of the findings along with extensive research makes her so awesome, and me very lucky indeed. Thank you so much Brambleberry for shining a light on a great subject along with Susan because in the world of Bath and Body Chemistry she is Definitely a Keeper! What is the url of Susan’s blog? And I diddo all the great comments of knowing people. I want to learn to make these things. You can find Susan’s blog at http://swiftcraftymonkey.blogspot.com/. This is great! I would LOVE a follow up blog post of what is NOT a preservative that some people will misconstrue as one. I know things like Vitamin E (a good antioxidant), GSE, and ROE (rosemary oleoresin extract) are not actual preservatives but I am constantly reading a lot of people who believe they are. So is this the Brambleberry blog? I was just going to email Brambleberry. Hi Melissa. I have some posts in the chemistry section of my blog on what cationic, anionic, and non-ionic mean, but it sounds like you’re asking where to find out what charge each ingredient we use might be? As a general rule, surfactants that foam and lather are anionic or negatively charged; cationic polymers like polyquat 7, and cationic emulsifiers, like BTMS-50, will be positively charged; oils, butters, emulsifying waxes (unless otherwise specified), extracts, solubilizers, and just about everything we use is non-ionic or not charged. The best way to find out is to ask your supplier or get the data sheet or bulletin on the product. I never tried making products before but I’m wondering if these preservatives can be added to baking soda & citric acid, that I keep separate until I want to use them both with cactus gel or seasons seed powered plus water. I just don’t want the preservatives to have a bad chemical reaction with the endothermic reaction of baking soda & citric acid(aka volcano experiment). I don’t know if the preservatives are even liquid which would set off th volcano effect with baking soda & citric acid. And if it’s it’s safe to use as bith even if it’s not liquid. There are some oils or seeds that stay better if they’re not exposed to sunlight. Can skem of these preservatives make it possible for them to be exposed to sunlight & stay good? Outstanding article. Many thanks to Susan and BrambleBerry for shedding more light on the mysteries of preservatives. gram-negative bacteria, yeast and mold, they offer excellent heat stability, work across a wide pH window and are easily solubilized in water. the guest mentioned that she couldn’t find any information on its efficacy against mold . but according to the above info. it is effective against mold. Also she said that “It is water soluble, so it’s not suitable for anhydrous products or things like sugar scrubs that do not contain water.” but actually according to lotioncrafter and the Herbarie it can be used to preserve anhydrous systems and emulsions. A great informative article- thank you! I have used preservatives in my water-based creations, but I have read that a preservative isn’t needed in a lotion bar because of its non-water based nature. I am now confused. Could you possibly clear this one up for me? Thank you! She had mentioned using phenonip in lotion bars above, so that left me confused. Thank you for the response! So exactly what is a lotion bar, and how does one use it? So can a lotion bar be made with goat milk? As I mentioned earlier, I do raise diary goats, so have an abundance of goat milk ready for use. Can one make a lotion bar with goat milk? What would be a recipe? I’m not necessarily in the spot to start creating my own recipes (formulations), as I’ve not made any of it yet. LOL. However, I’m eager to learn. I also have high hopes of creating some products for resale. Please, if anyone can tell me if there is a PH stick or something to use to test our PH levels? If so, what are they and where to get them? Also, how do we test out shelf life, without waiting for mega years to test them out? And do we see the old etc with naked eye? So how do we test out shelf life? How to package properly? Potency of the products used? I’m not worried at all about my essential oils, because I only use the ones from my trusted essential oil company. However, I do wonder about my other questions. Perhaps this could be another post, as well? RE: making products for sale? But if anyone has thoughts on these above questions? A lotion bar is a solid product that is typically a combination of waxes, butters and oil. When you apply it, the heat from your skin starts to melt the bar and moisturize your skin. Because they don’t contain water, they don’t need a preservative. I’ll include a few recipes below. Usually, no liquids are added to lotion bars. You can add liquid to lotion recipes. 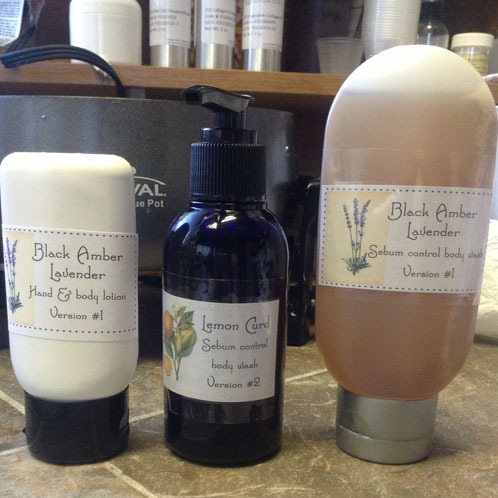 We have tried out several lotion recipes with goat milk and haven’t found one we liked. If you find one that works for you, please let us know! Also, If you’re using 100% goat milk in your recipe the lotion will last about 6 weeks, maybe a little longer in the fridge. However, if you’re only using 10% goat milk in your lotion recipe it will probably last about 6-9 months. This is including a preservative. We sell pH test strips you may like! Also, we have some great posts on packaging and selling your products. I’ll include them below. How does Phenonip do with the Polysorbate 60 in E wax? I use E wax and Phenonip. Testing reveals no evidence of contamination in my lotions but since poly 80 inactivates Phenonip, I just wondered. . . I was wondering the same thing. I recently switched to Phenonip from Germaben for my lotions. I made two test bathces one with the preservative and one without just to see what it would do to the texture, if anything. I was satified with my tests so I made a regular size bath (about 48oz) and after about a week they got a weird smell to them. It also got pockets of liquid throughout it. I’m not sure what happened. It’s my regular recipe, only difference is the preservative. My e-wax has poly-60 in it so that could be the problem. I’ll refer you to the study in which they tested various non-ionic ingredients with Phenonip. On page 4, you’ll find the chart which notes that at 2.5% and 5% polysorbate 60, Phenonip was significantly deactivated. (http://dl.dropboxusercontent.com/u/1020026/inactivationofpreservativesbynonionics.pdf) I guess the question is how much polysorbate 60 are you using in your product? If you’re using 5% e-wax and polysorbate 60 makes up 50%, then you would have 2.5% polysorbate 60 in your product, which could inactivate the Phenonip. If you can get it tested, I’d recommend it. The same study showed that 2.5% polysorbate 80 inactivates Phenonip significantly, but 5% doesn’t. Interesting result, eh? I love Susan’s blog! She’s a wealth of information and her blog is full of fantastic entries to read (and search). I’m happy to see she is a guest blogger and is able to sell her books in your store. We are so glad you enjoyed this post, Susan sure knows her stuff doesn’t she? :). We love her blog as well! Thank you for the great article. I use phenonip for my lotions but have been including optiphen into my oil only body butters and sugar scrubs just in case. I am surprised that it does not contain anything to fight mold. Im thinking now of switching to either optiphen plus or optiphen ND instead. I need something that works in a waterless formulas and is easy to use as far as temp and ph. 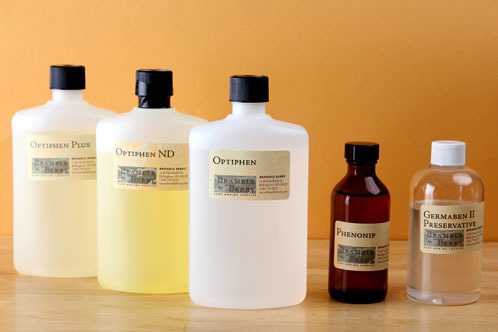 I like that the optiphen family is paraben and formaldehyde free. What would be my best choice, considering these parameters. Thanks a ton! Hi Amanda – Phenonip is an effective broad spectrum preservative. I use it in all the classes I teach. I don’t recommend switching. =) I’ll let Susan chime in though. “There is some debate about whether or not Optiphen Plus and Optiphen ND are suitable for anhydrous products. In their own marketing materials, ISP sometimes notes they are and, at other times, says nothing. This is the topic of much debate, and I don’t feel comfortable suggesting that someone use Optiphen ND or Optiphen Plus in anhydrous products. Phenoxyethanol is sparingly oil soluble, which means it can be dissolved in oil, but not enough that it could effectively protect your product. 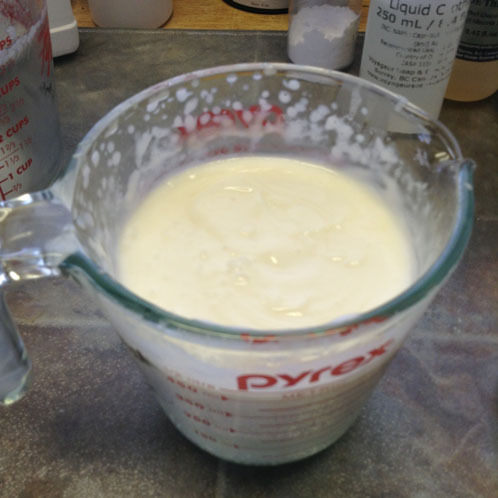 I guess I’m wondering why you wouldn’t want to use Phenonip – which can be used in oil soluble creations – in your anhydrous creations? It’s a great preservative for non-water containing products! Thanks for the wonderful information. Where can we find more information on what is cationic, etc? And what would you use as a preservative in cream soap? As for cream soap, to be on the safe side, especially since it’s typically something people dip their hands into, I would use a preservative at 1%. Five parabens is not all parabens, and the ones they are banning are not very common in cosmetics. Thank you for the excellent information! You’re so welcome, I’m glad you enjoyed this post! Interestingly enough, the ones they are banning are not commonly used in cosmetics and none of them are present in Germaben II, the most common paraben based product for preservatives. Why not use a non-hexane processed Japanese Honeysuckle extract? The same quality used by Chinese medicine docs for hundreds of years. Ones that are not grown in Japan right now due to the radiation. It’s not a paraben, but while structurally close, it is not. However, it is a broad spectrum preservative. Synthetic parabens are xenoestrogenic, and can disrupt hormones. It may not make a difference a time or two, but it will build up in the liver and fat after years of use. 99% of Americans have parabens in their urine. Sodium Methylparaben is a widely used preservative here in the States, and it has been banned in Europe. Some years ago now. We get exposed to more than enough synthetic and petroleum based products, why expose yourself to more, and one that is Aho easily absorbed and stored. Japanese Honeysuckle extract isn’t a broad spectrum preservative. It has some bactericidal abilities, but there is no evidence it can offer more than that. It contains a naturally occurring paraben called para-benzoic hydroxy acid, which behaves as the bactericide. You will have to add other preservatives to it to make it a broad spectrum preservative. There is no difference between something derived synthetically and one derived naturally when we look at the molecule. For instance, we can create Vitamin C in the lab and take Vitamin C from a lemon and it’s the same molecule, they’re both Vitamin C molecules. If it didn’t look the same, it wouldn’t be the same molecule. So a Vitamin C molecule that doesn’t look identical to the one from the lemon isn’t a Vitamin C molecule, it’s something else. In this case, para-benzoic hydroxy acid is the same whether it is synthetically derived or comes from Japanese Honeysuckle. There is a preservative that uses honeysuckle called NataPres (http://swiftcraftymonkey.blogspot.ca/2011/09/preservatives-natapres-ecocert.html), INCI Glycerin (and) Leuconostoc/Radish Root Ferment Filtrate (and) Lonicera Japonica (Honeysuckle) Flower Extract (and) Lonicera Caprifolium (Honeysuckle) Extract (and) Populus Tremuloides Bark Extract (and) Gluconolactone. This is not a broad spectrum preservative in most situations. You’ll have to add something for fungi and yeast. I’ve had a few people say on my blog that they still grew mold using it.